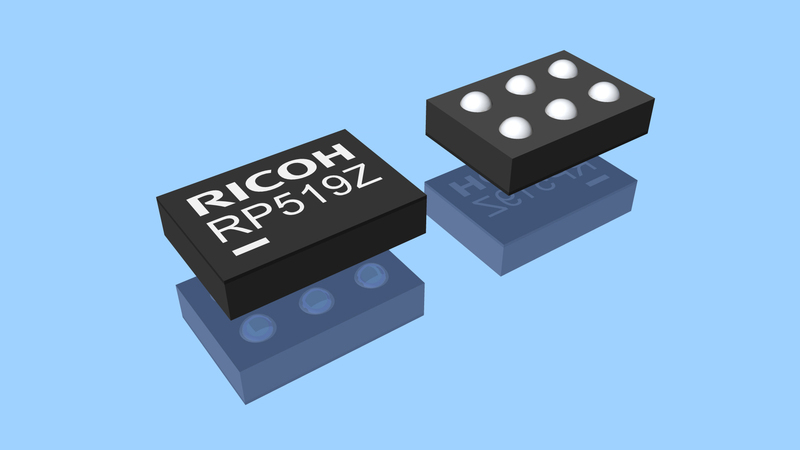 Ricoh Europe B.V. Semiconductor Support Centre has introduced a low height, synchronous PWM/VFM step-down DC/DC converter, which is available in a 0.5A or 1A output current version. The compactness of the RP519 DC/DC converter makes it ideal for designers to use in space- and height constrained applications, such as smartphones and watches, wearable devices or small wireless communication and DC/DC converter modules. Embedded in an ultra-small WLCSP-6-P8 package, the high performance RP519 offers a solution occupying 1.12mm2 of circuit board space, the size of a pinpoint. With a height of only 0.36mm, the RP519 integrates easily into the thinnest applications. Other factors contributing to PCB space reduction are the high 6MHz operating frequency (requiring a small sized inductor), a small capacitor, embedded driver transistor and synchronous rectification, making an external diode superfluous. Forced PWM operating mode; the DC/DC converter switches at a fixed frequency rate, which has a lower output noise compared to VFM operating mode. PWM/VFM auto switching mode; the DC/DC Converter switches between PWM and VFM mode automatically, resulting in the best efficiency level at either low or high output current demand. The RP519 utilizes various protection circuits to ensure a safe operation of the power supply. The under voltage lockout (UVLO) function disables the RP519 if the input voltage is below the threshold of the minimum operating voltage. The inductor over-current limit circuit protects the DC/DC converter and other electronic parts of the application from damage and is internally set to either 1.6A or 1.0A. This circuit restricts the Lx peak current at each clock cycle. If the current exceeds the current limit, it turns the P-channel transistor off. Internal thermal shutdown is included; disabling the RP519 as soon the junction temperature reaches 140°C and releases the protection circuit at 100°C. Additional features include internal soft-start circuitry to reduce inrush current, booting the internal circuits in 150µs. The fixed output voltage is internally set and ranges from 0.6V to 3.3V, to be set in 0.1V steps. The adjustable output voltage ranges from 0.6V to 5.5V, with use of an external voltage divider. The optional auto-discharge function discharges the output capacitor rapidly, when the RP519 is disabled by the CE pin. The embedded transistor connected at the Vout pin is turned on and shorts the capacitor to ground.